This isn't exactly a paper craft post, but then again it might be. Quite a few years ago my sister-in-law taught me how to use old catalogs to make pretty vases. After a move and change of themes for my dining room (primitive), I decided to try my hand at one. 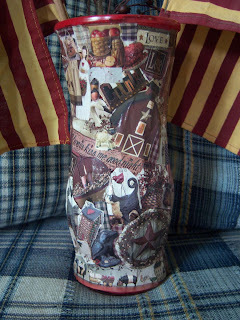 Step 6: Cover the entire surface with Mod Podge to seal and make waterproof. 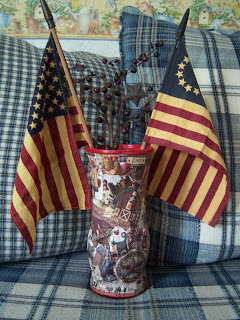 Here are two close up shots of the vase --- so you can see how it's all put together. 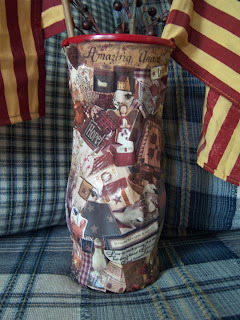 Here is a blog that is totally dedicated to Mod Podge crafts --- pretty interesting! What a great patriotic vase! a wonderful project! Such a fun project - turned out great!